Because every moment is an "opportunity" when you're a parent, I've been (until today) delighted to ride bikes with Eight to school in the morning (her school starts at 7:55 a.m. and it's about 10 blocks away). 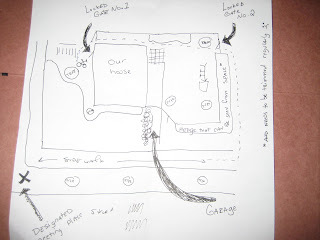 This morning, I pointed out her bike, which had been left almost literally at our front door, and said to meet me at the corner (see diagram) as I went through the garage to get my bike. We had been running out of time to be able to bike because she had a bit of math homework to do before school. For those of you who don't have school-aged kids yet, you can look forward to helping with math problems (she said facetiously). Eight year olds, being themselves, are literally immune to help due to the fact that they are already in possession of all relevant knowledge. Or any real direction, advice or anything resembling any of the above. Anyway, I ambled down to the garage (no coffee in my body yet), and reported promptly to the designated meeting location where Eight was nowhere to be seen or heard. My heart sort of skipped, but I just waited. At some point the neighbors across the street pulled out of their garage, heading toward school and, because they were in a car and on their way, I realized that we could be cutting it a bit short, on bikes as we had planned and still, she was nowhere in sight. I thought, could she have already headed out on her way to school? Had she taken a "quick" warm-up around the block? Where in the %$#@& was she??? At some point I see her round the alley. She: You said to meet at the garage? Me: Okay, but how did you GET to the garage? She: Through the backyard and two back gates? They were locked, you know. . .
Me: Um. Why didn't you just come down to the sidwalk and go to the garage? She: I didn't know there was another way to the garage. Heh. Don't think this kind of thing will be stopping any time soon. I still get these kind of answers out of my 12 year old.